I am just an ordinary housewife in my 60's. I have been using this pair of lavender jadeite as pendants since I was a little girl as they are from the family's heirloom. Many experts told me that they are Imperial Lavender Jadeite circa late Ching Dynasty. It measures 2 inches in diameter and 0.25 inches in thickness. They are set in silver. I would appreciate if experts in this forum can give me an opinion as well. Thanks. This looks like artificilly coloured items if the colours are correct. If so, then they are not old at all. A better/larger picture with a strong light shining through from behind might give more insight. Is the color shown here the true color of your lavender jadeite pieces or are they different? Are you sure they were set in silver and not in platinum or white gold, are their any markings on the clasps? When were they bought and where? I have them tested by a professional laboratory today and it is confirmed that they are natural jadeite and the color is natural as well. They are set in silver because of the hallmark (marking). Not white gold or platinium. There is no doubt that these two pices are made of jadeite. The reason I ask if the photos show their real colors is if this is indeed their real colors then there is no way these are natural lavender jades and they had to be dyed despite what the professional laboratory told you and you should should ask for a refund of your testing fee. The natural color of lavender jadeite is not this "purple" color but more a "pink" color. Therefore I have to agree with both Ernest and Randy that these are two "dyed" piece. Further more, even if they are both natural lavender, their lavender color are simply not bright or complete enough to command a high premium. If the pieces are truly bright "pink" (lavender) jadeite, then they will not be set in silver. Platinum, yes; white gold or even yellow gold, yes, but not silver. (*However, after saying that I do remember seeing a very nice white nephrite jewlery carving set at silver. May be Randy can elaborate if silver or even 14 k gold were being used in antique Chinese jade jewleries.) There is also no Imperial lavender jadeite, imperial green, yes. I am not even sure lavender jadeite was even popular in the Qing dynasty. I saw a very beautiful bright lavender jadeite plum carving set in platinum for sales in St. Louis and we wanted to purchase it as a graduation gift for our daughter and they wanted $1,4000 for it. We didn't want to pay that much but the piece was real well worth the money. I owned quite a few pieces of lavender jadeite carvings and rocks myself, once you see one you will know the difference. This is just my personal opinion and I can be wrong especially if the true color of these two jadeite pieces are different than that of their pictures. P.S. Almost single piece of these so called dark purple lavender for sales in bargain prices are fakes and are dyed. Pure and bright lavender jadiete is quite rare and expensive. The Chinese also like the "bubble gum color" jadeite which comprises of lavender, white and green color. Once again, most of these bubble-gum jadeite are also dyed. You always get what you pay for. 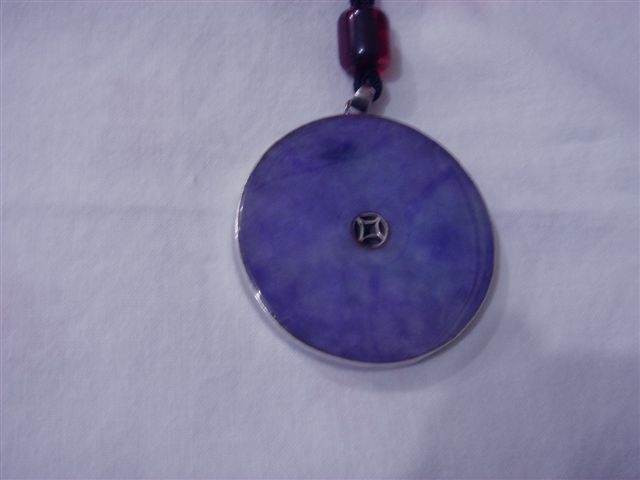 True lavender jade can be intense to purplish blue and highly transluscent like a light color amethyst. I had paid $500 for a small deep intense lavender jadeite oval cabochon in the early 1980's. Under incandescent lamp(yellow light) the lavender jade will appear more pink. When placing it under flourescent lamp, it will appear more bluish. The white spot was a factor to determine its being natural or not. It can be either natural or color-enhanced. Most lab can not test on lavender that well if they were only "Slightly" color enhanced without a lot of dye. One traditional testing is to burn it slightly to check for irregularity. I might be wrong, but I do see that the color are in spider web pattern which is a sign of dying. 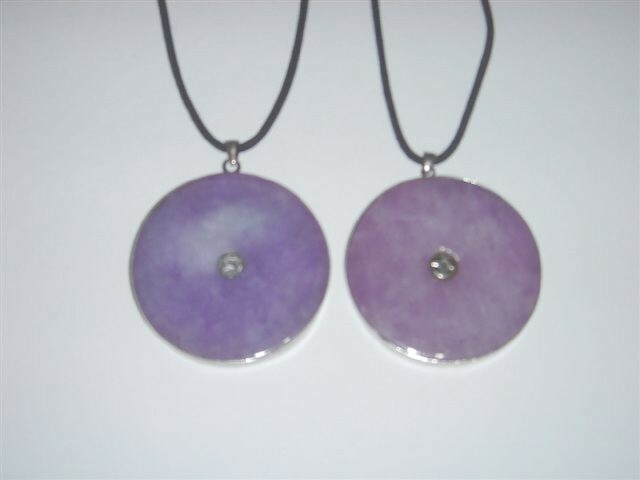 Lavender jadeite discs like that are usually color-enhanced or dyed. Was the white spot there and the color was like that when you first got it? This style of jade discs are called "Wy-Gu"(Remembering the past), and Qing Wy-Gu are smaller than 2 inches in diameter. So this is most likely a 1960's product. I just read an article about jadeite suppliers in Myanmar and Chiengrai, Thailand. It said that 90% of jadeite in the world market are dyed and color enhenced. And they dyed small stones that are already cut opended too. In HK, the lavender jadeite bangle on the street hawkers may cost you more or less than USD 100.- unlike in the jewelry shops that certified natural color will cost you more than USD 2000 for a lavender jadeite bangle. I think your lavender jadeite discs are new and dyed. The lavender color is uneven with dots of strong and light color pigments unlike the natural one. The picture is too blur, I may be wrong. I am not going to argue with the professional laboratory since they are the most reputable laboratory in Hong Kong where I am living. Their services are used by reputable and well known jewellers in Hong Kong as well as international auction houses here. I am satisifed. Why they are not set in gold or platinium? They were set after the war and my mother didn't have money then to use gold. I called them, imperial because my mother once told me they were owned by imperial officials. I am not using the word "imperial" in the same context as imperial green which I know what they are. 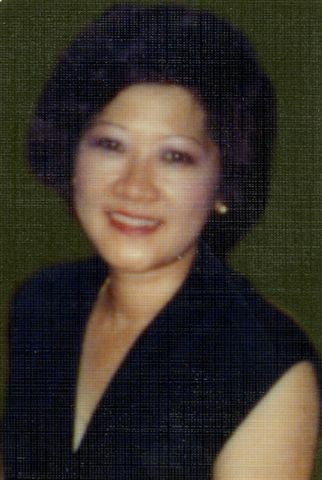 Pardon my English language as I am an old Chinese woman who hasn't had the opportunity to be taught English at an English school. I learn English through trials and errors. I would suggest you to have your items appraised. As long as the professional lab certified your jades, you should consider and treat them as genuine natural jades. Lavender jades are more rarer than Imperial jades, and with that size, they should worth a lot of money. It may also be a good idea to invest a little more money to set them into platinum or white gold with some small diamonds. With the certificate and the more deluxe setting, the value of the jades will be greatly increased. It was possible to obtain natural color lavender jadeite in the 1960's, and things were available at low prices in the older days. The bare spot being white might have been a good indication that it was natural because a faker would have dyed it completely. I was just a little troubled by the spider web pattern of the color. I wish you can post the other side of the jades for us to look at. And I very much like to see light shining through it from the back ! Perhaps you prefer not to do that? Thank you. Tell you something, I took them to a very reputable jeweller (Chow Tai Fook) in Hong Kong for them to give me an opinion without showing them the certificate which I got from the laboratory. The feedback I got was "Amazing". Then I said, "Wait a minute. Some "experts" of a certain forum told me they are "dyed stuffs". The reply I got was "These "experts have not seen the rarest of the rare yet. Well, if you are still not satisfied we can buy them from you. We will give you cash that is not "dyed". I told them I don't intend to sell them. I am more interested to donate them to the museum or someone who really appreciate good jades". I don't intend to reset them in gold or platinum as the value is not in the gold or platinum but in the jade. Furthermore I don't want to take away what my mother had done. To her setting them in silver had cost her "lot of money" during her time after the war although in today's term it is peanut. I will when I have the time take pictures of the other sides. I also have a good "collection" of other jade items which include what they called "mutton fat" nephrite. I have a "mutton fat" nephrite bracelet which had been valued at HK$1 million (1 US$ = HK$7.78). Coming back to lavender jadeite I came across a lavender archer ring in The Forbidden City Museum in Beijing when I was there last year. The color and texture are exactly the same as my pair. For this reason I am so interested to investigate my pair further. That archer ring is classified as a "National Treasure". I don't believe they (Beijing) will display a dyed lavender archer ring and classified it as a "National Treasure". Have you ever heard of a classical Chinese song called "The Lavender Hairpin"? I agree with you lavender jadeite is more precious than imperial jadeite. Although I am not a jade specialist but I know Chinese history very well. The opera,"Purple Hairpain" was in fact historically misdated. The story, costume and dresses used are for Ming. But lavender jades did not arrive China until 1800's during Qing Dynasty. I felt funny when I first heard of some college students calling me uncle in the early 1990. I even received some unexpected senior citizen discount at the buffet sometimes without noticing it. I love to help people getting rid of pain and health problems, and I don't charge money for that! I aged faster for helping people, and I have a lot of white hair. I want to see the HK$1 M nephrite bangle! Can you post the picture or send them to my email in private if you don't want to show it in public. The mutton fat bangle has to be antique with elaborate Gong(carving work) and made with the finest grade of Hetian nephrite material in order to be appraised at that amount. Who did you go to in Hong Kong for an appraisal like that? A friend of mine, Mr. Johnny Ng of Jades-N-Gems Corp in California had sucessfully developed a Master Color Stone Chart of jadeite in the early 1980's. You probably can google to see different color, shade, texture, jargons of different varieties of Burmese jadeite. The rarest color that looked like a turquoise was not on the chart. I regret that I did not buy the only cabochon that I saw in the earliest 1980's. When I get back to Hong Kong I will take pictures of the "mutton fat" nephrite bracelet. Yes, it is Hotien "chi liu" (river pebble). Good quality jades (nephrite or jadeite) don't need "gong" as "gong" tends to hide defects of the stone. My "mutton fat" bracelet doesn't have any "gong". It has natural russet on it forming the image of Kwan Yin. Amazing. I don't need to have it appraised as people in China are willing make offers. It is question of rarity and supply and demand. People in China these days have money running out from their ears. I walked into a major jade store in Shanghai today. The general manager of the store had keen eyes. He saw the lavender I was wearing. Politely he asked me if I could show it to him. He was so amazed by it. Have to run. I have to monitor the New York Stock markets which are now opened. This is more important than jades as far as I am concerned (smile). You're correct. They are called "Wy Gu". Did you know the Chinese traditionally made them in pair. I know it because Chinese history is my forte. In ancient days, they were called them "Pi". Correct me (being an old lady) if I am wrong. I don't know how old you're but friends call me "Auntie Judy". The white spot could be a reflection of a light. I can confirm that this is not a reflection of a light. I flew to Shanghai today from Hong Kong to do some Christmas shopping. I am buying some silk in Suzhou as Christmas gifts for friends living overseas. I will take a picture of the other side of the lavender for you in the morning. I can only take the picture of only one piece (the piece which Ernest said the white spot could be due to a light reflection). The other piece is kept in a bank deposit box in Hong Kong. As I am living alone I am keeping all my jade collection in a bank deposit box for security reasons. As I have said earlier I have been wearing this piece with a string since I was a little girl I use to change the string periodically as it will get worn out over time. Since I have nothing to do in my hotel room I changed the string again just now but this time I added a small bead to it to position the jade. It looks so beautiful with the bead on. You have to see it to see the difference. Since you really appreciate good and rare jade I will share another amazing piece with you and others here in this forum. I have a piece of jadeite which the Chinese called "Ping (ice) Zhong". The background is white with natural (I emphasize natural) golden yellow russet on it. The golden yellow russet forms a beautiful mountain landscape. I nicknamed this piece as "The Wonder Of Hwangshan (Yellow Mountain of China). This piece is oval in shape measuring about 4 inches in diameter. I have it set in gold. You have to see it to appreciate the real and natural beauty of this rare "Ping Zhong" jadeite. I will take a pictue of this piece when I get back to Hong Kong. I should be back this weekend. The white spot on the left bi-disc appears to be color zoning/distribution. Lavender jade has been my favorite since at least the earliest 1970's. I still have several Lavender "Saddle" rings, but I had dropped the best(most intense) one and caused a hair line racture. I wonder if you can share images of the "Saddle (Ma On) Ring" which has the most intense color to enable me to learn from this specimen. I am not good at digital photography! My lavender rings are cheappies that are not intense enough. It is hard to get the ring with the color spot right on the saddle. 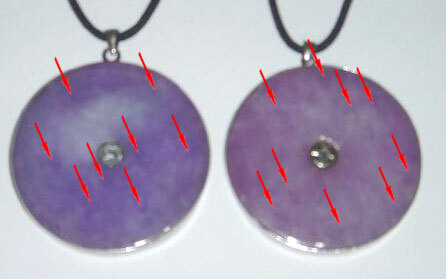 Basing on the new jpg, the lavender Bi-disc shows veins that look natural. So this is a rare form or "Ji-Fei"(紫翡). You are correct. They do have veins that are natural. Here are the images showing both sides. I am still in Shanghai and will return to Hong Kong in the morning. As I will be leaving for Australia next week to have a warm Christmas I am taking this opportunity to send an early Christmas greeting to all who have so kindly help assisted me being a novice collector. Your invaluable advice and guidance have been extremely useful to me as I love art, culture, history, tradition. Apart from jade, I also collect ceramics, paintings and other antiquities. As this is the first time I posted in this forum , I find the fellowship here very cordial and friendly. I will continue to post to seek your advice. 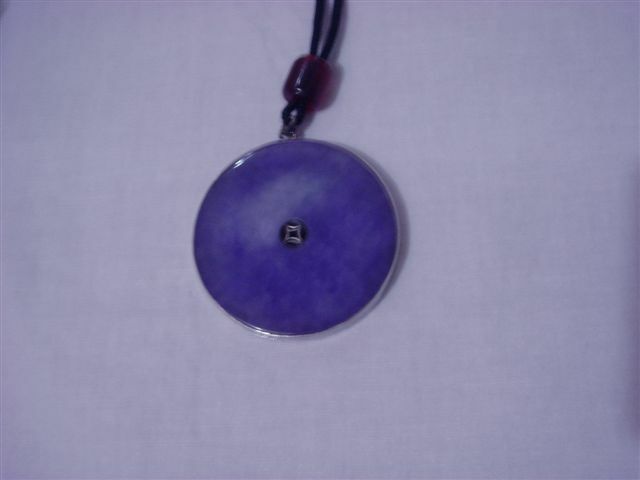 In Hong Kong you can have your jadeite lavender pendants send it to Hong Kong Jade & Stone Laboratory (HKJSL) for test and certification if it of Jadeite natural type 'A'. Even Sotheby's Auction (Hong Kong) & Christie's Auction (Hong Kong) send their clients jadeite to HKJSL for test and certification before accepting it for their auctions in HK.